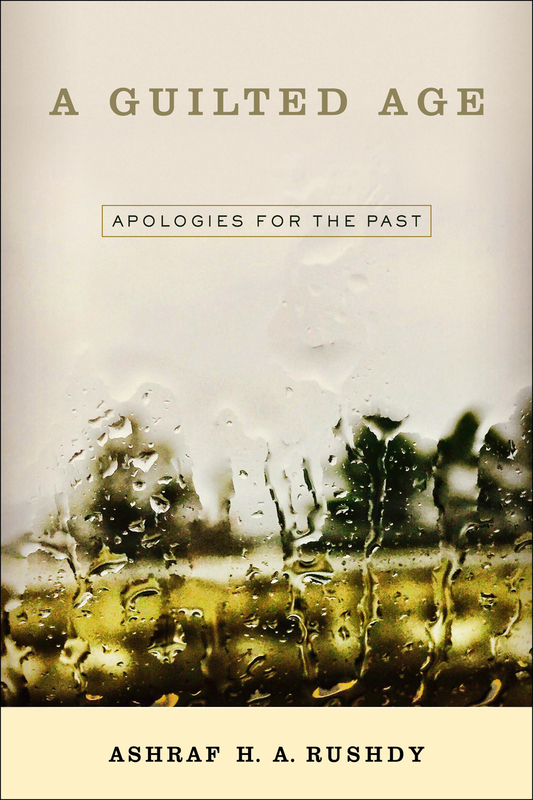 In this blog entry, Ashraf Rushdy writes about the recent phenomenon of apologizing for the past and how it shaped his book, A Guilted Age. On August 15, 2015, Prime Minister Shinzo Abe apologized for Japan’s aggression during the war and for its colonization of China and Korea. His apology was delivered on the seventieth anniversary of the end of WW II in the Pacific theater. His apology, according to most commentators, used all the right words – and, in Japan, there is a significant difference in terms that express “deep remorse” and those that offer actual “apology” – but his apology nonetheless did not ring true. The New York Times called it an “echo,” and the Japan Times referred to it as his “sorry apology of an apology.” Partly, the effect of insincerity came from the fact that Abe was echoing previous prime ministers’ apologies and making it clear that he was part of a different historical trajectory. He was, after all, the first Japanese prime minister born after the war, and he therefore belonged to that vast majority of eighty percent of Japanese who, like him, as he reminded us, were born to a postwar world. So, even while he insisted in a repeated refrain at the end of his speech that Japan must “engrave in our hearts the past,” it was clear that he was tired of being haunted by it. What he wanted was for future generations “to inherit the past,” but not “be predestined to apologize” for it. The other reason that his apology rang as insincere is that he sent a monetary gift to the Yasukuni Shrine, which celebrates Japan’s military might, houses the remains of some of its war criminals, and represents to Japan’s neighbors precisely the kind of aggressive ultranationalist politics that led to their colonization. It was an apology that the world expected, one on which Abe had certainly received a great deal of advice, not only from the panel he set up to consider the wording of the statement, but also from foreign media pundits and political figures. Indeed, a few months before, no one less than German Chancellor Angela Merkel had urged him not to water down the anniversary apology and pointed out, in a perhaps unwelcome bit of comparison, that Germany had been able to “face our history” and apologize and therefore establish good relations with her neighbors. Abe’s apology, then, like all political theater, was anticipated, scripted, advised, delivered, and then reviewed. What does it mean when a politician offers an apology on behalf of a nation for that nation’s past actions? How did apology become a recognized form in international relations – a diplomatic instrument in the same way as treaties, tribunals, and trade agreements? That is part of the story I explore and tell in A Guilted Age. Intrigued by this political development, and what it might tell us about the postwar epoch, I set out to discern how apologizing for the past emerged as a practice. There are notable moments in that relatively short history that stand out for us: Prime Minister Tomiichi Murayama’s apology on the fiftieth anniversary of the end of the war resonates as Japan’s most felicitous statement of contrition, and German President Richard von Weisacker’s on the fortieth anniversary quickly became the gold standard for political apologies. I wanted not only to appreciate these important moments, though; I wanted to understand what these apologies were doing, and what led to the widespread belief that they could do this particular work. I wanted, in other words, to discern just what kind of political events and philosophical responses to them inaugurated a guilted age in which public apologies for the past could flourish. As I undertook my research, it quickly became clear that we lived in a world awash in apologies of all sorts. Corrupt politicians, scandal-prone celebrities, and rogue corporations regularly apologized to the public – and it was assumed that the public needed this confirmation of penitence. What struck me was that these apologies differed in meaningful ways – and not just in the fact that some came across as more sincere and others as less. They differed substantially in what they addressed. I felt that it was important to make distinctions, and the one that seemed to me particularly salient was whether the event for which the apology was offered had direct survivors or not. When Abe apologizes for Japan’s conduct during the war, the so-called Korean “comfort women” hear him, as do survivors of Japanese war camps. When Pope John Paul II apologized for the Crusades, no one who heard his apology was directly affected by the event. The historical event for which apologies have been offered – colonization, slavery, religious wars – assuredly have palpable and deeply significant effects on our modern world, but the apologies for them differ, in tone and meaning, because they are addressed in a different way to a different audience. That distinction, then, between apologies that are for recent political events for which we have survivors (WW II) and older historical events for which we don’t, was worth making so we can better understand the different kinds of works these two distinct sorts of apologies do. Having explored their origins, and made distinctions among the different kinds of apologies for the past, I set out to understand in just what ways we could understand what these apologies represent. I focused on two topics. The first has to do with what precisely an apology does. Many commentators believe that an apology can undo the offending behavior. Most of them – but not all of them – believe that this is true in a symbolic rather than a physical sense. When I say I am sorry that I stepped on your shoe, I indicate that it was done by accident and not maliciously, and so you do not feel that you were targeted or disrespected by the event. The effects of the event are changed; your rising resentment at being mistreated is derailed and changed to something else. In that way, an apology can undo what was done. The analogue statement is “forgive and forget,” which likewise sees the value of erasing the past. Such an idea, of course, translates badly when we think of larger political and historical events for which apologies are offered; and I wanted to see just how this deep belief in the power of apology’s capacity to erase might residually affect what apologies for the past mean. The second has to do with what an apology is supposed to express, namely sorrow. There is a key ambiguity in that idea that politicians and other people with less power sometimes take advantage of by saying we are sorry for instead of being sorry that. “I am sorry for your loss” means one thing; “I am sorry that I stepped on your shoe” means quite another. One consoles by grieving, the other accepts responsibility. That ambiguity is sometimes used deviously in political apologies. When China demanded an apology from the Bush administration for the downing of one of its military planes, Secretary of State Colin Powell apologized by saying that America was sorry for the loss, but made it patently clear that the administration was not accepting responsibility for the event of the loss. In other cases, though, the ambiguity appears to be more of an honest categorical mistake made by people who perhaps intuit that grieving is the more appropriate tenor for the occasion. By looking at key moments in that history and examining some particular apologies, I show that apologies for the past that seem to express contrition are actually expressing mourning, and why that matters. Apologizing for the past is a relatively new phenomenon, and one that bears our understanding better because it both has great potential and carries great risk. The past matters because we live in a world formed from it, and we need to figure out in what ways we can address it. Some have revered it, others reviled it, some see in it randomness, and others a discernible and meaningful pattern. To these older approaches, we can add those who wish to draw inspiration from it by being consoled that it is past, by redressing its ongoing damages, and, maybe, by atoning for it – and thereby claiming it – in words, gestures, and a mixture of celebration and grief.